1. Cook the rice in boiling water according to pack instructions. 2. Meanwhile, heat the oil in a large non-stick frying pan. Slash the skin side of the fish fillets using a sharp knife, then dust with the cornflour. Fry in the hot pan for 3 minutes on each side until golden brown and completely cooked through. Remove and keep warm. 3. Mix together the soy sauce, vinegar, honey, sesame seeds and 1 tbsp water, then pour into the pan and cook for 1 minute to heat through. 4. Drain the rice and divide between two plates, then place a fish fillet on top of each. Pour over the sauce, scatter over the salad onions and chilli, and serve with the steamed greens. 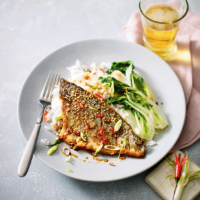 Cook’s tipYou can use any white fish for this recipe – sea bass and monkfish fillets would also work quite well with the Asian flavours.